Well kept shrubs and hedges can do a lot to enhance your home landscape design. Neglecting them, however, will cause your home to look unkempt and have a negative impact on the appearance of your yard. Many homeowners put off tasks like pruning and hedge trimming because they worry that they do not know how to do the job properly, and don’t feel like expending the effort on something that could do more harm than good. In reality, hedge trimming is a job for anyone up to the task. You just need to get the right tools and take some time to understand some of the finer points of hedge trimming. Adding the best battery powered hedge trimmer to your toolkit will guarantee that your greenery will be in tip-top shape whenever you need. The first thing you need to understand is the right time of year to trim your hedges and shrubs. If you’re working with your standard non-flowering shrubs, you want to do most of your trimming after the new growth has formed. For plants with spring-blooming flowers, you should do your trimming after they bloom. When trimming plants with flowers that bloom in the summer, look to maintain them in late winter or early spring. In addition to the annual trimming where you do most of your maintenance and shaping, you are also going to want to do some periodic trimming to help the shrubs and hedges maintain their shape. Having the right trimming tools can make a significant difference when it comes to the amount of time and effort you put into the task. It also impacts the quality of the results you get. At a minimum, you are going to need a set of handheld pruners to perform the pruning. However, if you have thick branches that need to be cut, it can help to have a set of loppers and a small pruning saw or oscillating tool. For trimming, you have the choice of using hedge shears or electric or battery powered hedge trimmer. Some people still prefer the old manual hand shears, but there are several advantages to using electric or battery powered hedge clippers. The best corded and battery power hedge trimmers will make the job easier, get the work done in less time, and make it simpler to achieve cleaner, straighter cuts. For an electric, corded option, the 4.5 AMP 24″ Rotating Head Electric Hedge Trimmer is an excellent all-purpose trimming tool. If you do choose to go with a battery powered hedge clipper, these cordless models should be ideal for most homes. They are easy to use and your working range is not limited by a cord. With a corded model, you do have the advantage of not having to worry about the battery running out. However, the best battery-powered hedge trimmers can run for a long time on a single charge. For most yards, the Worx 40V Cordless 20” Hedge Trimmer is an ideal option. 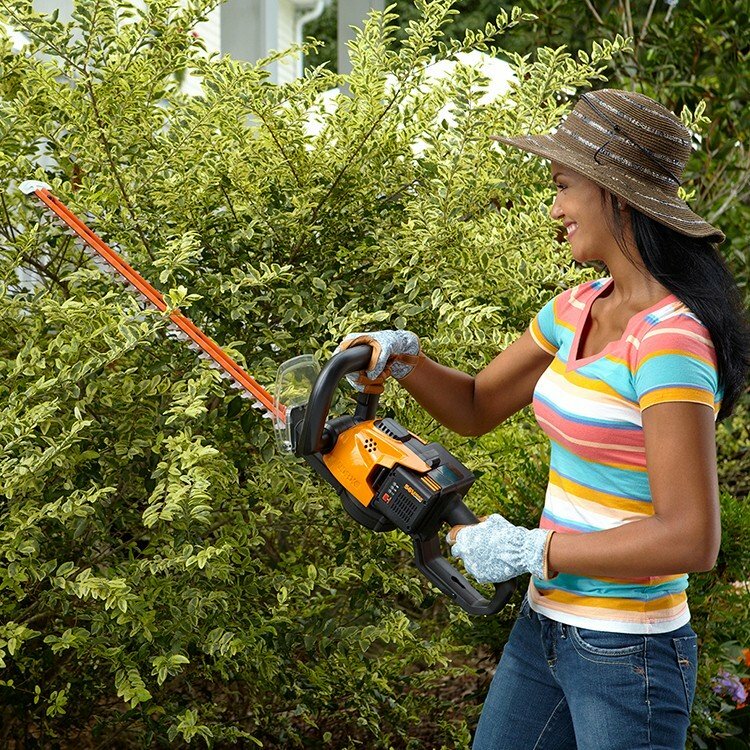 This battery-powered hedge trimmer is lightweight and it has good balance, making it easy to handle for both top trimming and side trimming. The 40V battery offers a runtime that should be more than enough for clipping the hedges on most residential properties. Start your pruning by removing any branches that are dead, damaged, or diseased. After that, take a look at the hedge to identify any branches that you want to remove. Generally, you are going to look for branches that do not conform to the desired shape. You should also use your electric or battery powered hedge clipper to remove any small offshoots that are growing near the base of the shrub. They can take nutrients away from the rest of the limbs and impact the overall quality of the growth on the rest of the plant. Start by using your corded or battery powered hedge trimmer to cut the sides near the bottom and gradually work your way to the top. Remember, you want to make sure light can get to the lower portions of the hedge. For that reason, you should try to achieve a slight angle with the base of the shrub being slightly wider than the top. To cut the sides, you just want to turn the blades of your battery powered hedge clipper so they are working vertically instead of horizontally. For small to medium size hedges, you could cut the top by simply holding the cutting blades of your battery powered hedge clippers straight and working your way across the top. For longer hedges, you are going to want to have a guide to ensure straight cuts. Especially for these larger hedges, the Worx 56V Cordless 24″ Hedge Trimmer can make trimming larger or thicker branches much easier. If the hedges are near the house, you could use the siding or some other object as a cutting guide. If not, you can set up stakes at either end of the hedge and run a string line at the desired height. There are two keys to good hedge trimming: Let the electric or battery powered hedge clipper do the work – don’t force the cutters into the shrub. Second, don’t try to trim everything away all at once. Instead, make shallow passes over the hedge and work your way down to the desired height. Get ready for Spring with the best hedge trimmers and clippers: Shop WORX now! Let the electric or battery powered hedge clipper do the work – don’t force the cutters into the shrub. Second, don’t try to trim everything away all at once. Instead, make shallow passes over the hedge and work your way down to the desired height. Thank you so much for your comment. Please come back to read more of our articles!